Apologies now if you owned a guinea pig growing up! 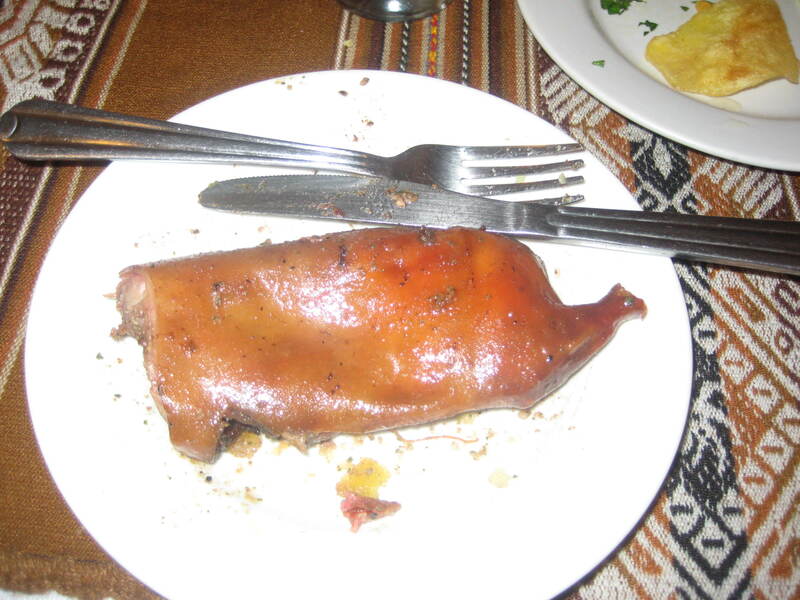 In Peru though, particularly the Andes, fried guinea pigs are popular as are other meats such as alpacas. 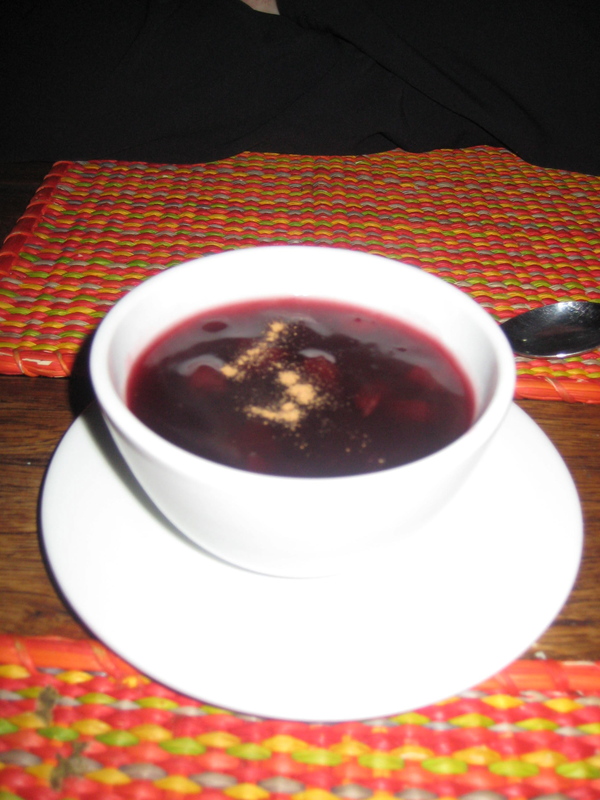 And we ate both during our stay in Cusco. Alpaca meat is so tender and is very low in fat and truly scrumptious. We ate alpaca skewers at Pacha Papa which we were told was a restaurant worth trying. But before trying the alpaca, we had tried a roast cuy at another restaurant. This restaurant had gorgeous Andean live music and the food was delicious but sadly, the cuy was not. Well at least we didn’t think so. We had hoped to order a full cuy but the restaurant had sold out for the night so we had a half cuy instead. So what did it taste like? Nothing like chicken, probably more gamey. It was stringy, there was very little meat and the skin, although appeared like crispy pork skin, turned out to be tough and rubbery! Now, all meats have a distinct smell, accompanied with the taste when inside the mouth, that usually differentiates it from other meats and the cuy was no different. The smell was actually quite strong and off-putting but only after it went into the mouth. We were glad we hadn’t got a full cuy! Peru also is well known for the different varieties of corn. Purple corn pudding was this delicious dessert that was introduced to us in Sydney by a friend from Peru and so we were on the hunt in Peru for the authentic real deal. And goodness, the hunt was worth it! But there was more to Cusco though than guinea pigs and alpacas. It was from here that we took a bus trip down to Ollantaytambo, where we stayed for one night before heading to Aguas Calientes, our base to the renowned Machu Picchu. So we cheated and didn’t do the Inca Trail – we had to sacrifice something to squeeze in the Amazon and it was this that had to give. From Aguas Calientes, it’s a 20 minute bus ride up and then another maybe 10 minute walk to get to a point where we could view the ruins as we would see them in pictures except better, much better. The size and magnitude of what was before our eyes dwarfs what we have seen in pictures! We even had the low cloud sweeping across which gave the effect that we were in the heavens looking down. 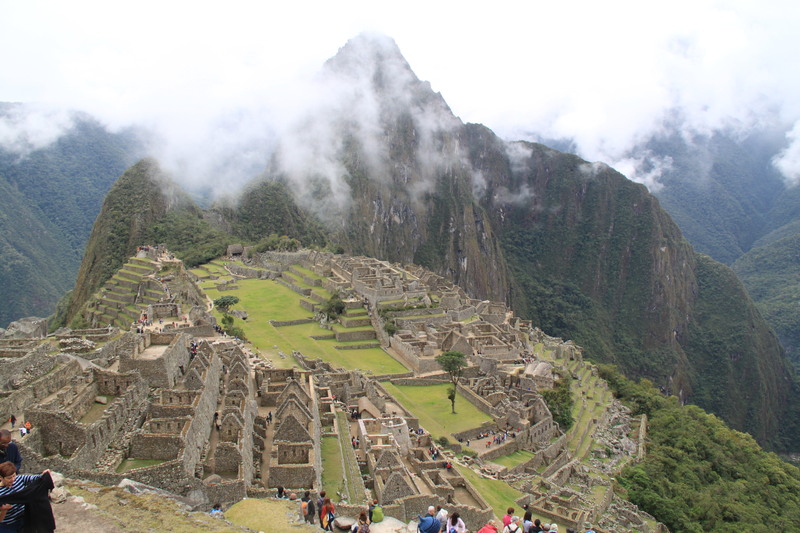 This entry was posted in Peru, South America and tagged Alpaca, Andes, Cusco, Guinea pig, Machu Picchu, MachuPicchu, Ollantaytambo, Peru.